and arranging. 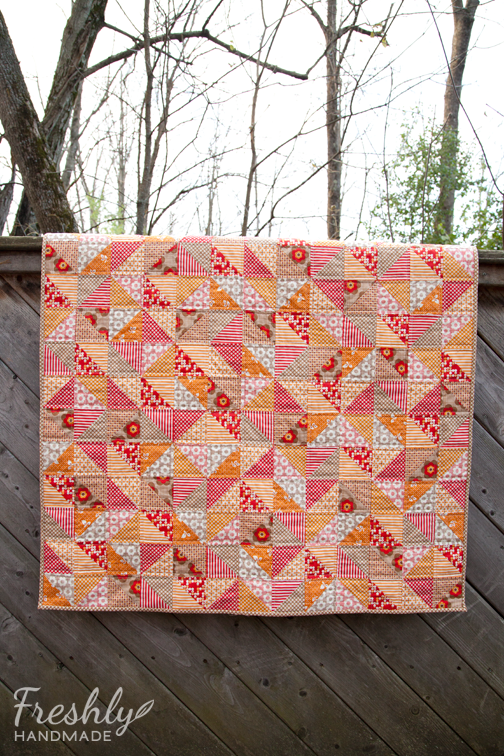 Since I called this quilt "Sugar & Spice", I decided on the pinwheel pattern, which always seems to have a sweetness about it. I'm liking the progress. I'll be back with more soon. 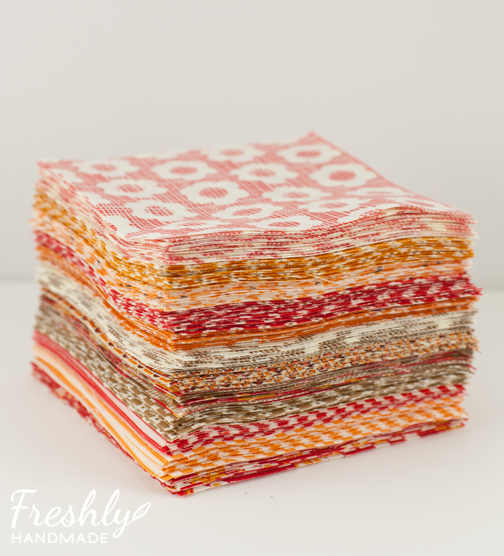 I'm at it again with the same fabrics I just used for the "Pumpkin Spice" quilt. 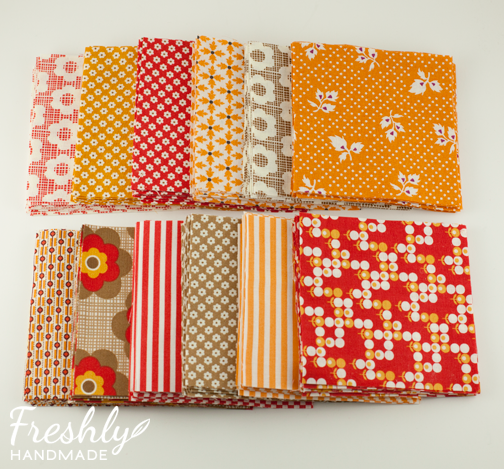 Typically, I'm eager to move on and use a new fabric selection, but these are just so right for the season and I have plenty of fabric to make another baby-sized quilt. 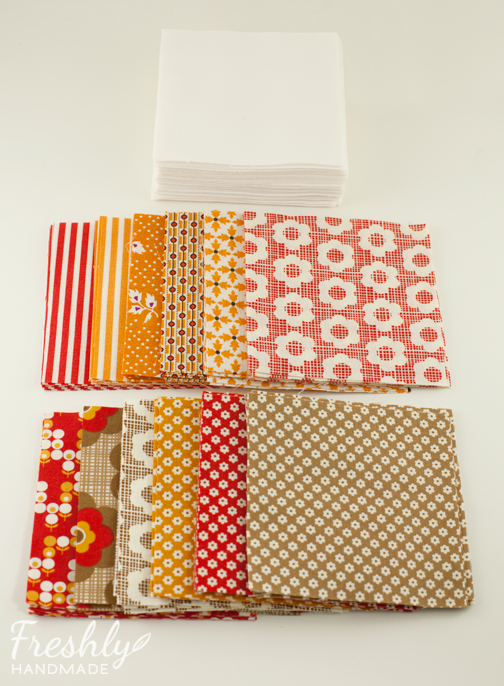 This time, I'm adding in some solid Kona cotton in Snow, which was my original plan for these prints when I purchased them. It seemed appropriate to name this one "Sugar & Spice". 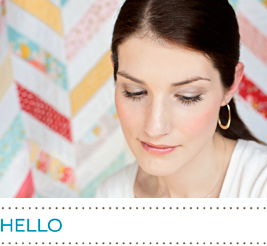 I'm sticking with one of my favorite blocks, the half square triangle. Here is a preview of a few that I worked up. More piecing and trimming await. Not a bad way to spend a Monday. I'll be back with more soon. 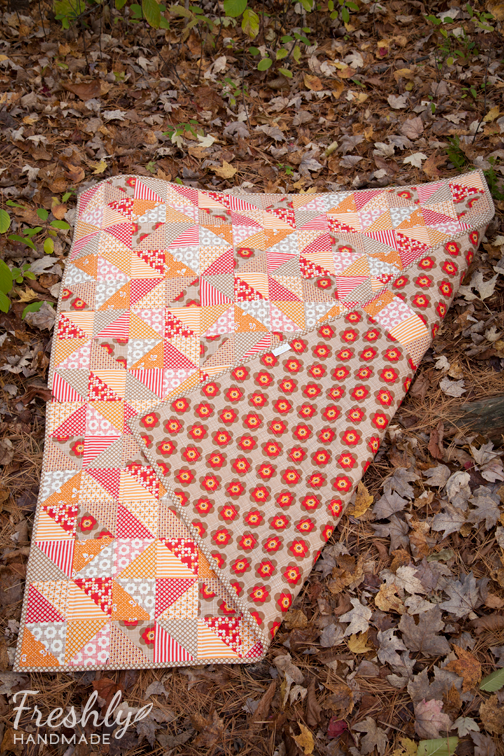 I finished this lovely autumn inspired baby quilt, which I am calling "Pumpkin Spice". I posted about the process previously here and here. 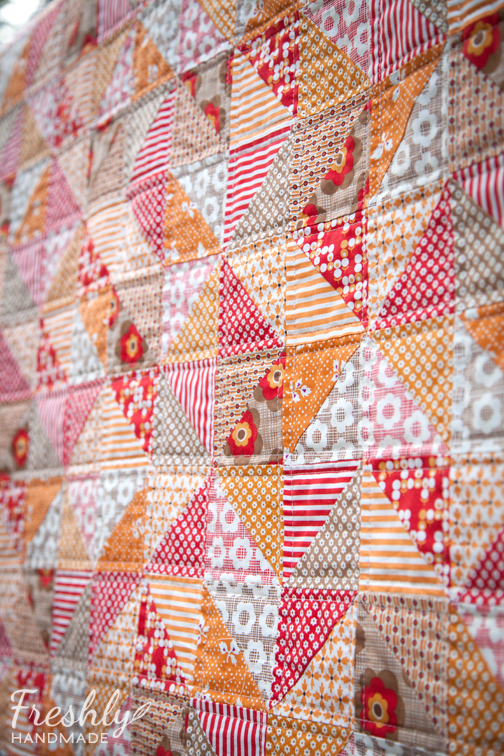 This quilt is created using a random pattern of 6 different half square triangle (HST) blocks. Almost all the squares could be twisted and turned in every direction, which gave me even more flexibility for placement so it didn't look like a repeat pattern. 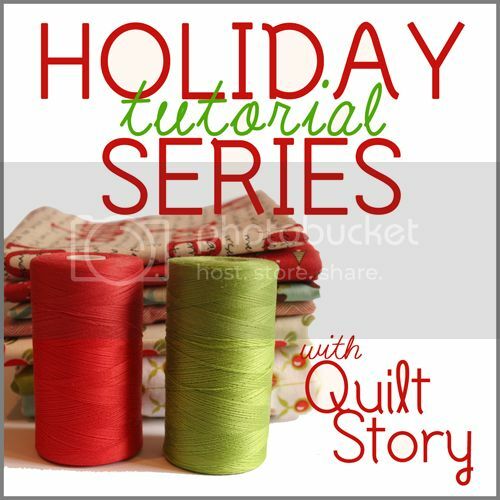 I am so pleased with the results and can see myself creating more quilts with this formula. 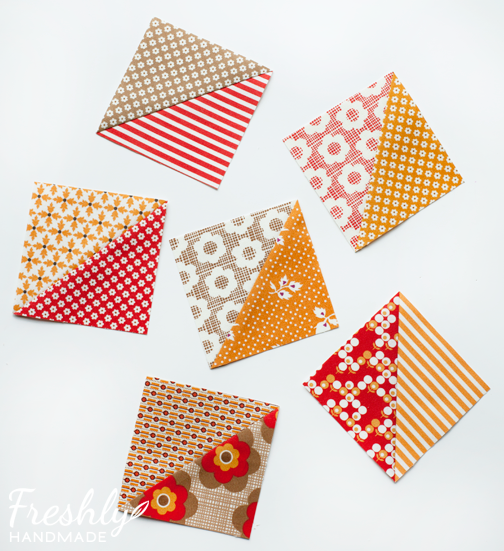 I really just love HSTs in almost every pattern -- they are so versatile. Yeah, they're a little bit of a pain to trim, but well worth it. 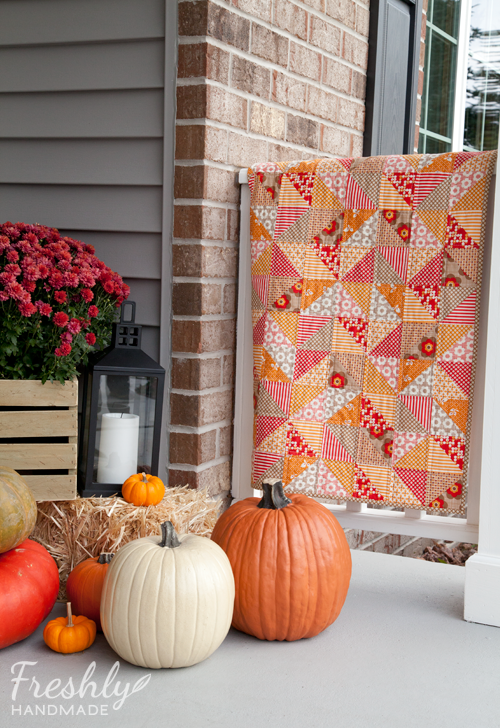 This quilt looks so pretty next to the fall decorations on my front porch, including my rustic wooden box. I was hoping to get some photos with the colorful leaves, but I'm almost too late for that since most have already fallen from the trees. However, my son and I went out looking for a great spot to take photos anyway, even though it's only in the 30s right now in Wisconsin! My little helper, this newly 8 yr. old, was awesome. So I may or may not have sort of bribed him with Pokemon cards. Regardless, we had so much fun just the two of us. In fact, he told me having a picture together meant more than getting the Pokemon cards. Tears!!! He really, truly is the sweetest boy I know. However, had he not been bribed a little, he may not have ever gotten out of his PJs to come help me. Once we were there though, he could appreciate the moment. Wise beyond his years this son of mine. My daughter was a little jealous when we got home and already called dibs on being my helper for the next quilt photo shoot -- just the two of us. 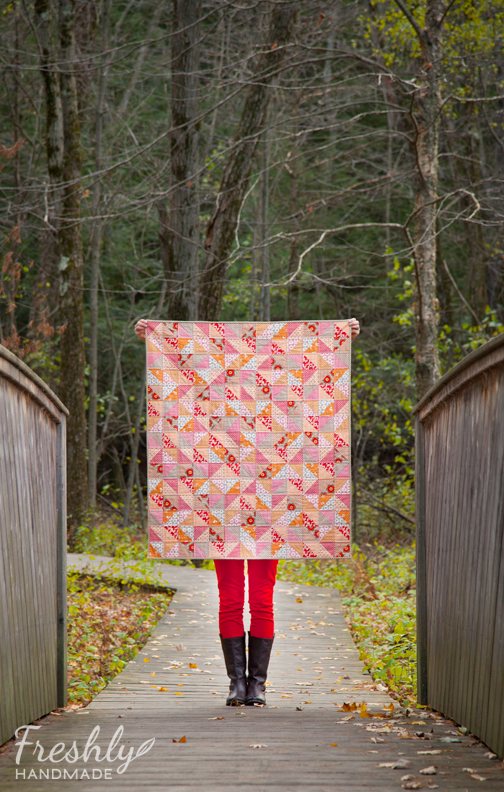 I'm linked up to Amanda Jean @ Crazy Mom Quilts for Finish It Up Friday. Have yourself a wonderful weekend! 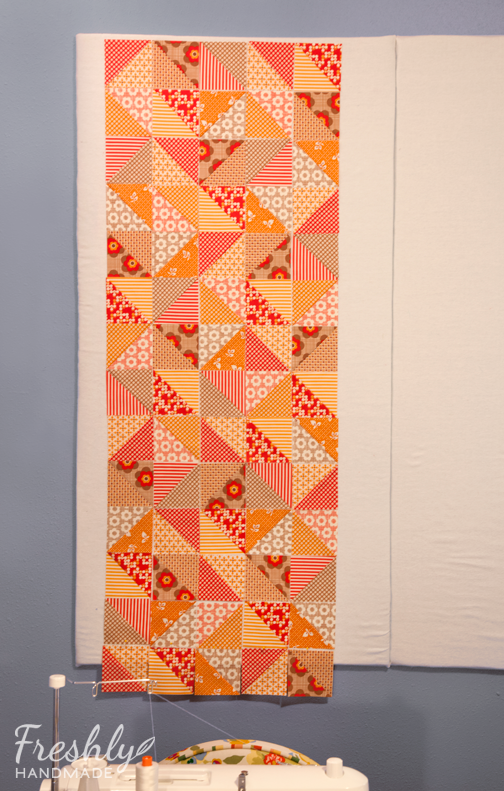 Here is the current status of the baby quilt I'm working on. You can read my previous post on it here. 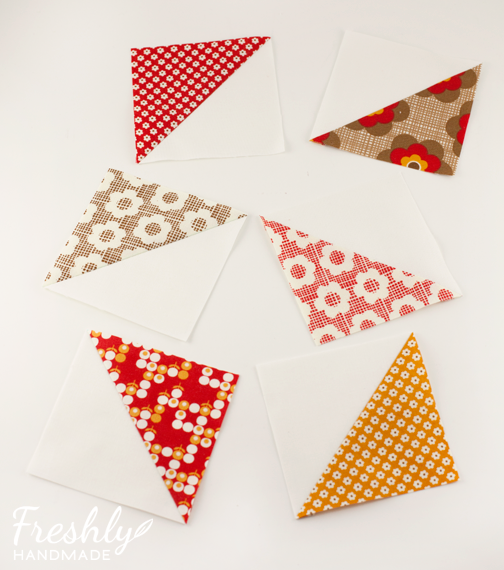 From the squares of 12 different prints, I've created about 200 half square triangles (HST). A good part of this time has been spent trimming and my back is feeling it. Here are the final blocks. 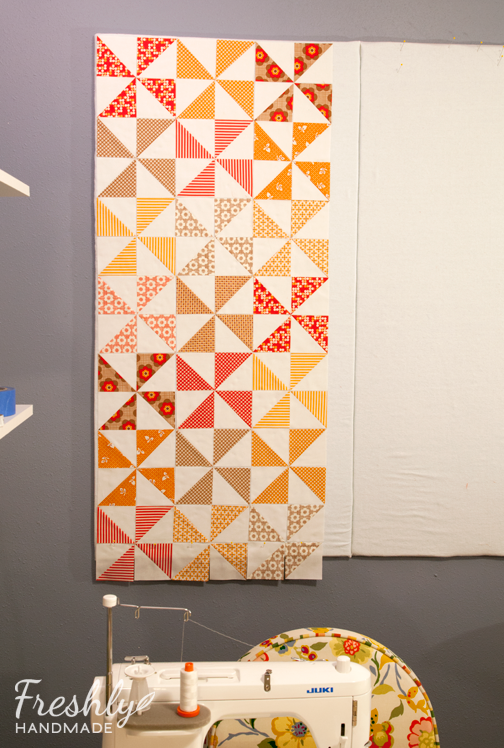 And now I'm auditioning the blocks on my design wall for placement. I'm almost there and I like how it's coming along. I hope to have the top sewn together today. More to come soon. 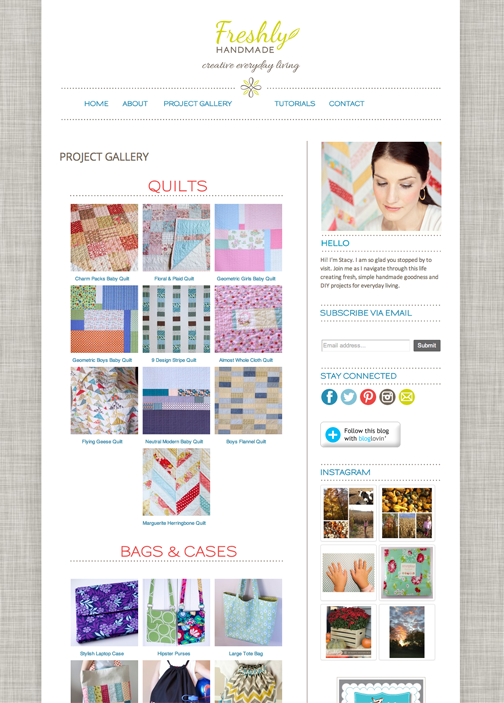 After cleaning up my site and organizing the project gallery, I realized that it has been months since I finished a quilt. 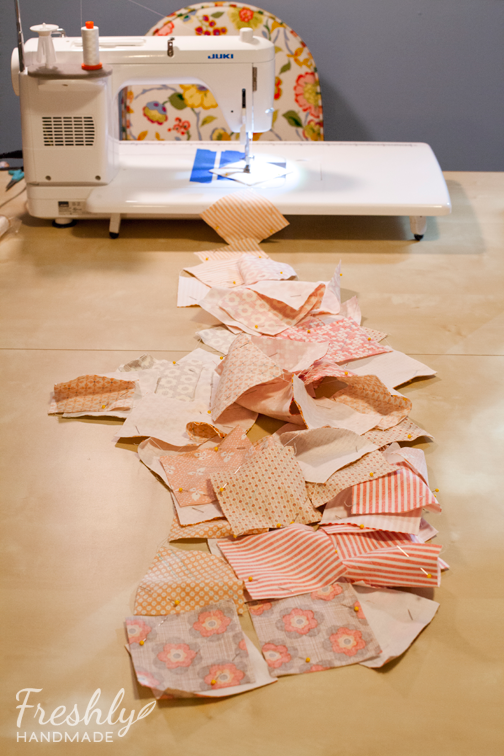 During that time, I've been gathering fabric and storing it away because I've had so many other projects on my plate. I just couldn't walk past the organized stacks anymore. I had to start a quilting project. So against my better judgement, knowing what other projects are still lingering around me, I grabbed one of the piles of fabric and said, "I'm doing this!" This past summer, I picked up several cuts from the Boho line by Urban Chiks for Moda. 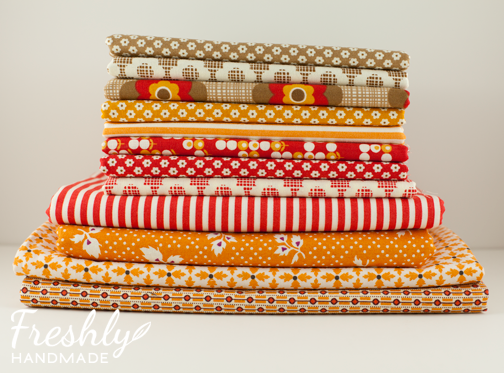 I chose many from the Earth, Clementine and Scarlet colorways. The prints are warm and feminine without being too girly. When I got home, I paired them with some prints from my stash -- the stripes from Bonnie and Camille's Marmalade line and a couple prints from DS quilts. These designs reminded me of Autumn and I wanted to work on a smaller project before it felt more like winter. 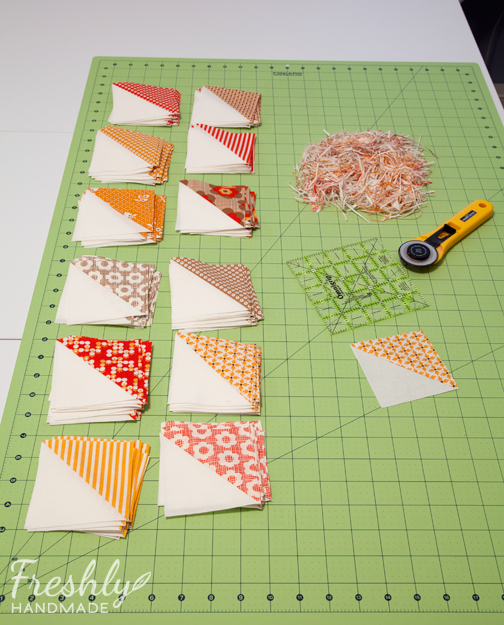 All these squares will be paired and sewn together into half square triangles (HST) for a baby sized quilt. I can't wait to get started! More to come soon. Happy Friday All! 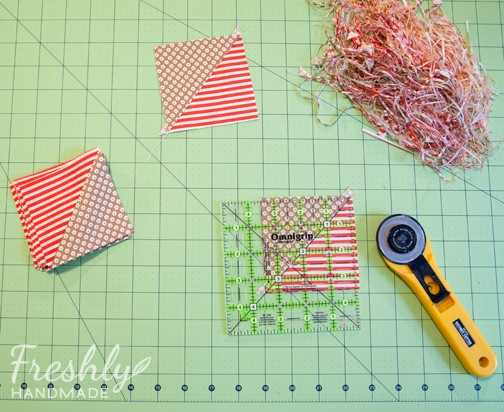 I wish I was sharing with you a new sewing or DIY project but today I just wanted to show you a few updates to this blog that I've been working on. Besides a mini cosmetic make over, I've FINALLY updated the Project Gallery and Tutorials pages. I know it's been over six months. What is wrong with me? So much has happened on this blog since then and I want to make it easy for anyone to search for past projects. 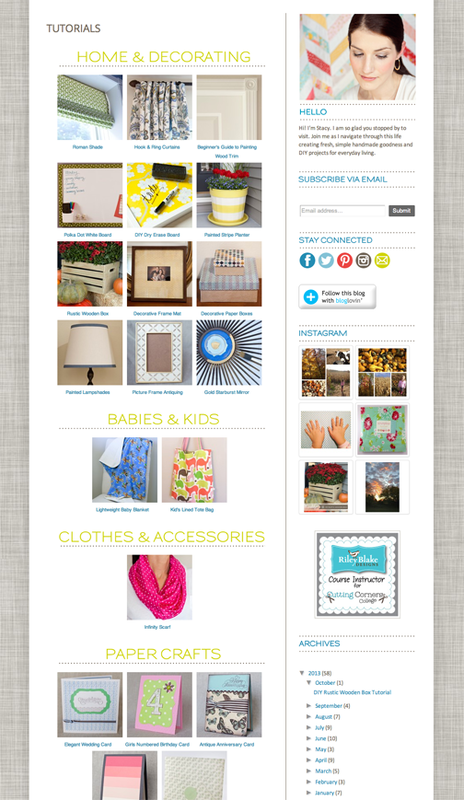 Head on over to these pages by clicking the links at the top and check out the updates. I hate to admit it, but things were looking pretty sloppy so I am happy to have projects categorized and the pages more cleanly formatted. Now that I've got this set up better, it will be easier for me to keep it updated. Plus, I have plans for additional content. This site will forever be a work in progress but it feels good to have at least taken the steps to get it to this point. Is it time to sew now? 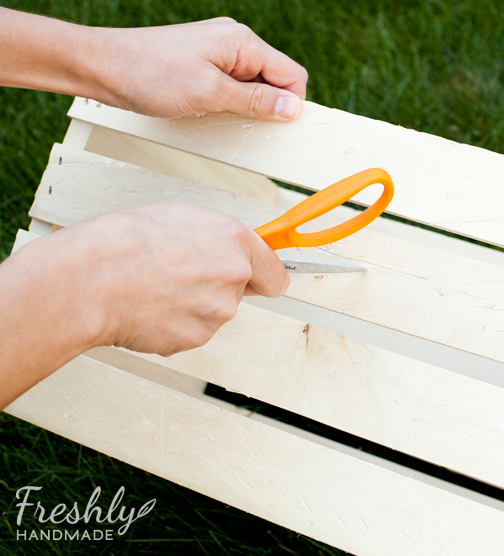 I'm celebrating the first day of October by showing you how you can create your own rustic wooden box, perfect for fall decorating. 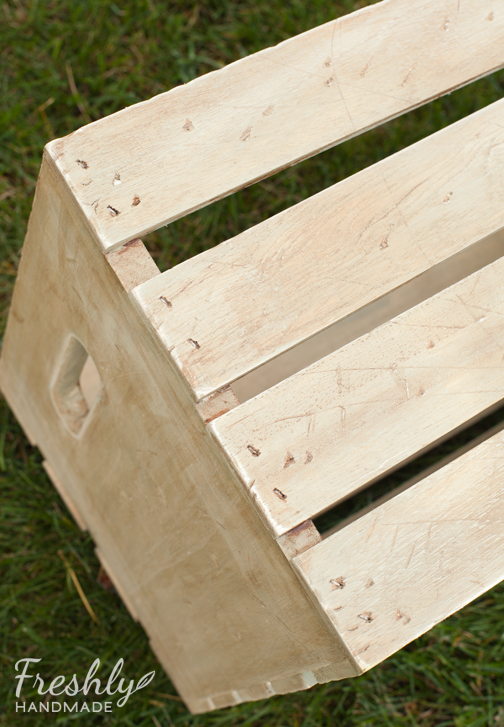 Here is the unfinished wooden box as you would by it from the store. 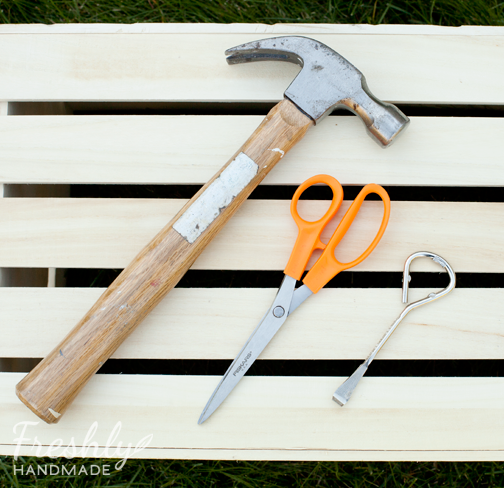 STEP 1: Gather your hammer, scissors and paint can opener. 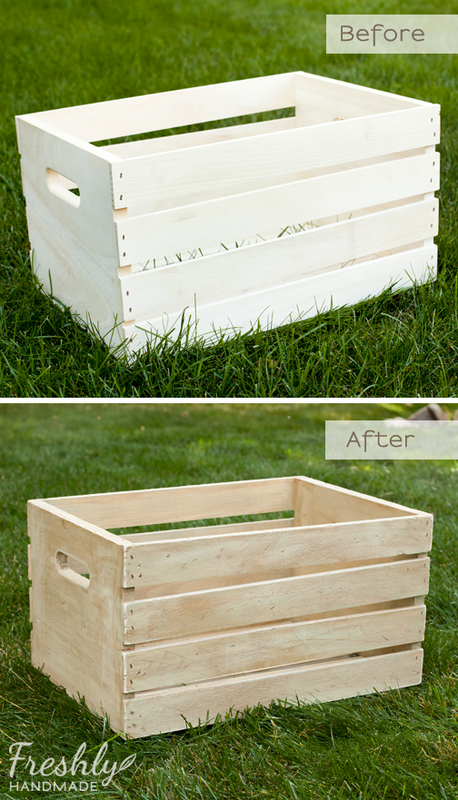 STEP 2: Beat up the box. With the face of the hammer, lightly pound the edges enough to indent the wood. 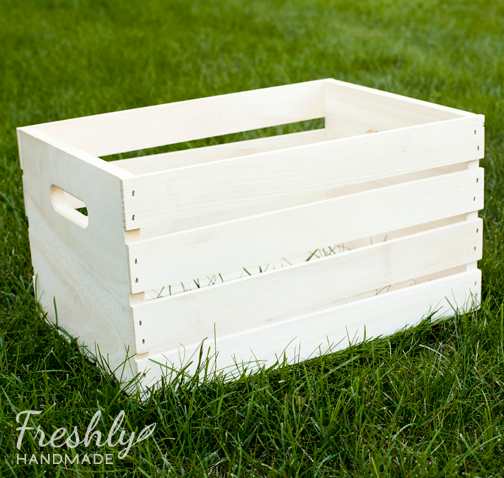 Most boxes like this are made from a soft wood so it doesn't take a lot of effort to do so. 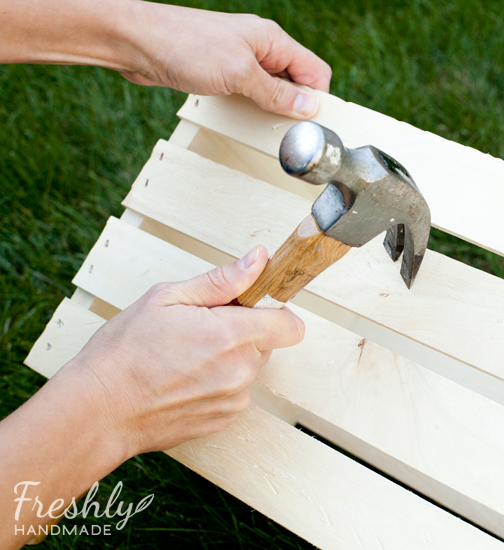 With the claw of the hammer, you can make indentations on the face of the box. Open up your scissors and scrape the face of the box in all directions. 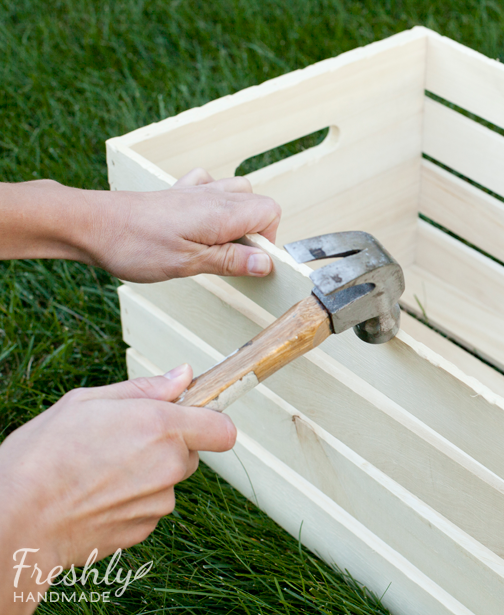 With the paint can opener, scrape the face of the box and the edges of the slats. There is no right or wrong way of doing this step so feel free to use whatever tools you have around the house to beat up your box. 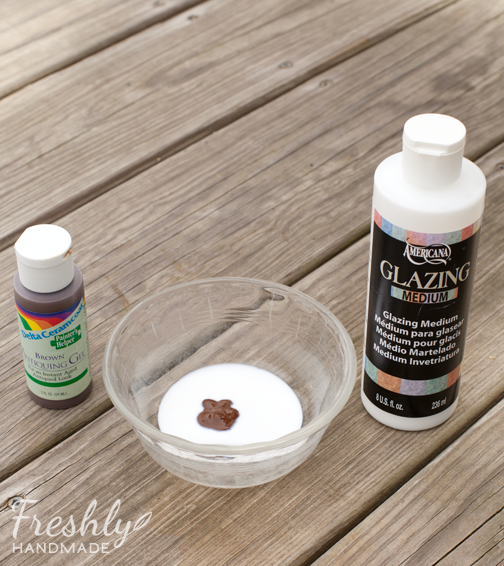 STEP 3: Mix your paint with the glazing medium to thin it out. 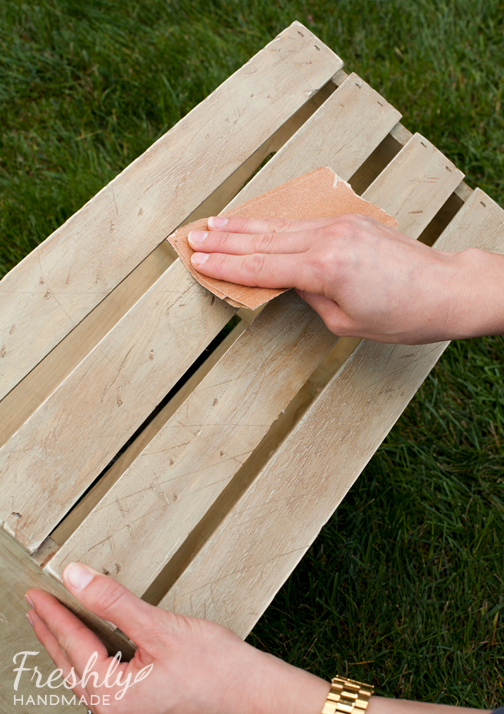 You don't want your paint to have full coverage, but more of a "wash" thickness. Here I used acrylic paint in a gray/green color mixed with an antique effect medium, but a regular glazing medium is going to give you similar results. 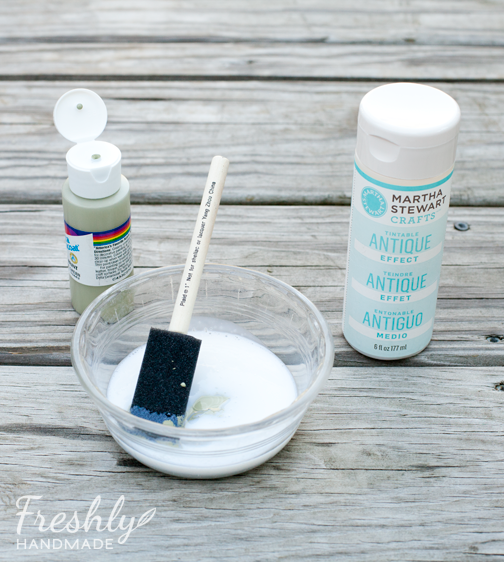 STEP 4: Brush this mixture over the entire box and let it completely dry. 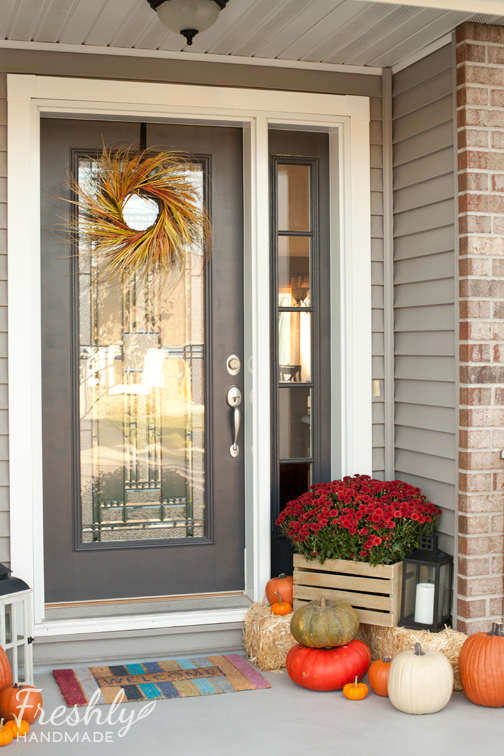 You don't need to be neat, but try to avoid leaving paint drips. 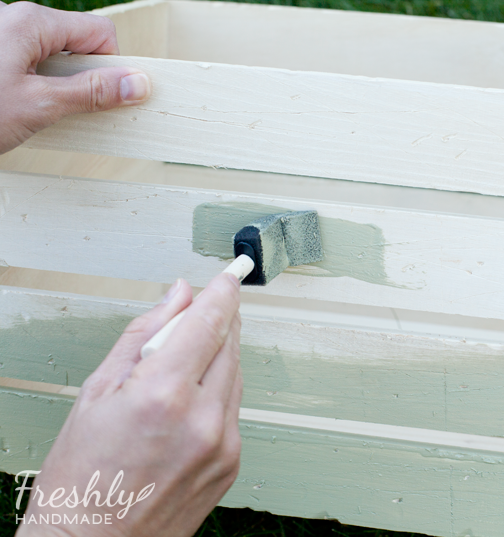 You also don't need to get the paint in the holes or grooves you created with the tools, as you'll fill those later. STEP 5: Mix brown antiquing gel with glazing medium to thin the gel. 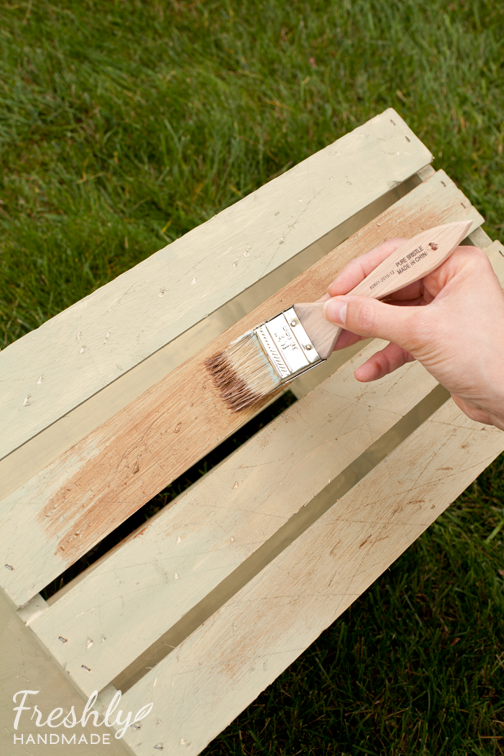 STEP 6: Apply a light coat of glaze over the box with a bristle brush, making sure to work the glaze into the holes and grooves you made with the tools. Work in small areas at a time. 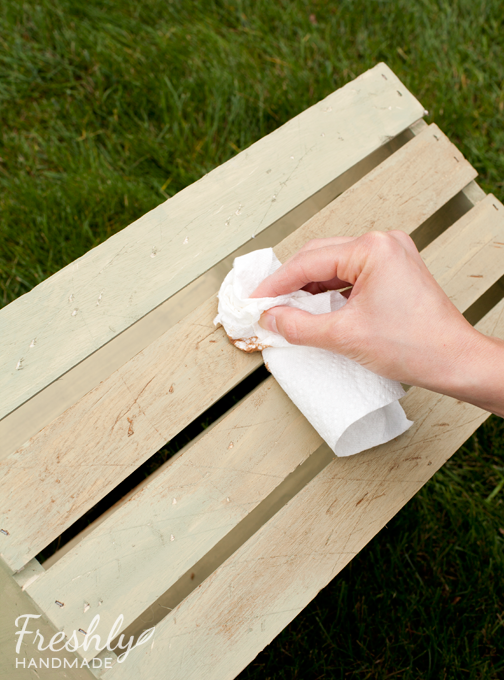 STEP 7: Wipe off the excess gel with a paper towel or cotton rag. You can repeat steps 6 and 7 if you want a darker result. Let the gel dry completely. 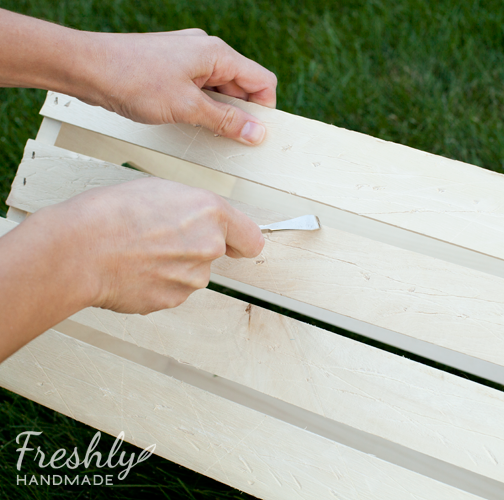 STEP 8: Lightly sand the corners and edges of the slats and box to reveal the unfinished wood below. You can also lightly sand the face of the sides and ends as you see fit. That's it! How cool, right? Here is a look at the before and after. 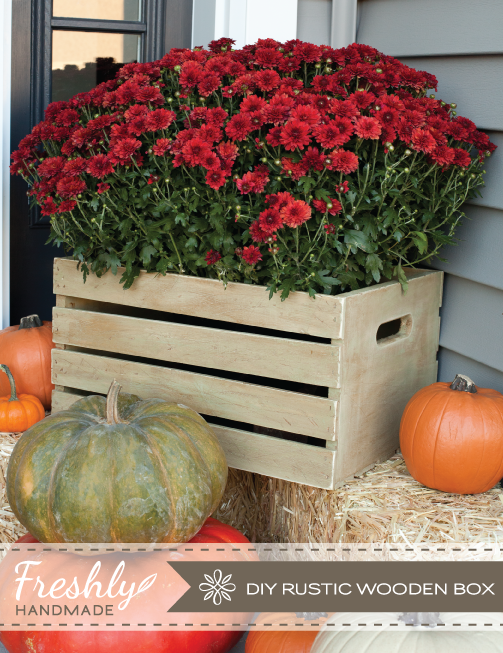 You can use your box for so many things, but I love how it looks holding my beautiful fall mum. I hope you enjoyed this tutorial. Now go make one of your own and let me know how it goes.